With Apple's quarterly earnings report for the 2010 holidays less than a week away, one Wall Street analyst believes Apple will sell a record 16 million iPhones, 6 million iPads, and 4.2 million Macs. Analyst Mike Abramsky with RBC Capital Markets said on Wednesday that he sees Apple's iPhone sales over the holidays increasing 84 percent year over year. At 16 million, that would well exceed the previous record of 14.1 million iPhones sold in the Sept. 2010 quarter, and put the company on its way toward a "holiday hat trick" of personal bests. 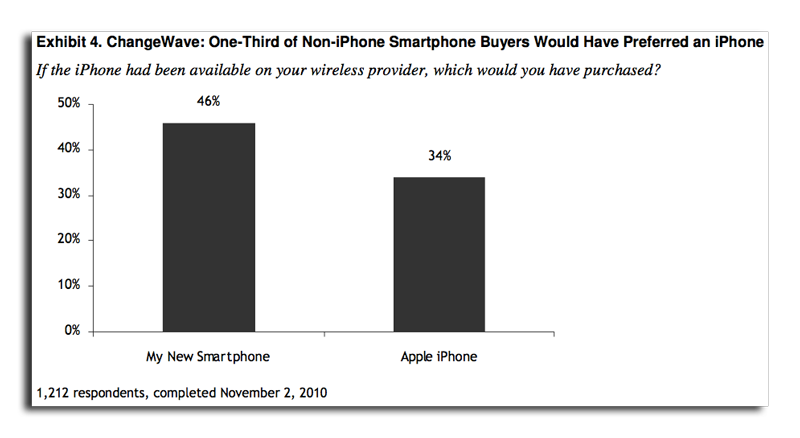 And Apple looks poised to have an even better fiscal year in the rest of 2011, with Monday's announcement that a CDMA variant of the iPhone is coming to Verizon on Feb. 10. He sees the iPhone accounting for 50 percent of all smartphone sales on Verizon in calendar year 2011, with a third of current Verizon smartphone owners upgrading to the iPhone. In calendar year 2011, Abramsky expects Apple to sell a total of 70 million iPhones, which would account for 19 percent of the global smartphone market. That would help Apple achieve $90.8 billion in revenue in its fiscal year 2011, with $20 earnings per share, he said. He has also called for Apple to sell 6 million iPads and 4.2 million Macs in the holiday quarter, which concluded in December. Apple notebook sales are projected to be bolstered by the popular new MacBook Air. Both the projected Mac and iPad sales would be new records for those product categories, as Apple achieved sales of 3.89 million Macs and 4.19 million iPads last quarter. In particular, he referred to the iPad as a "monster holiday hit." Finally, Abramsky also sees Apple selling a total of 18.7 million iPods in the quarter. RBC Capital Markets has increased its 12-month price target for AAPL stock to $395, up from a previous prediction of $365.